These bars have been a family favorite for a long, long time. Or at least, I can't remember the first time I had them, although I know it was my aunt Joan who introduced them. I'm also pretty sure this was the first recipe I learned to make all by myself. It's that easy. These days I use my little mini-prep food processor to make things like graham cracker crumbs, but back then my mom loaded the crackers into a ziplock bag and let me bash them with a rolling pin. I'm still a pretty big fan of cracker bashing. These were my grandfather's favorite. I remember the plate being passed around one summer day, coming to me before heading to him, and as I reached for the largest square, he told me "ladies don't take the biggest one." That's not something I was used to hearing from my grandfather. The same person who tried to start teaching me geometry before I could properly add. Who claimed that taking a dip in the pool was even better than an actual shower. Ladies? Really? So I went for the second biggest one, only to watch him grab the largest square right after me. Tricked. My mom, who wrote this recipe out for me, has kind of a funny way of writing down recipes. She tells you the ingredients only as you need them, rather than in one list at the beginning. I'll put them in bold below, so it will be easy to make your list. Spread the mixture in a 9x13 pan (pyrex, for example) and set aside. Remove the pan from the heat and stir in 6 oz. of chocolate chips (half the normal 12 oz bag, you can just estimate.) as well as a dash of vanilla (about a cap full). Stir until it's smooth, then pour the chocolate mixture over the peanut butter layer. Refrigerate, uncovered, for at least 3 hours before cutting and serving. UPDATE: One commenter suggested adding some salt to the peanut butter layer. I think this is a very, very good idea and a kind of modern update. I haven't tried it yet, but I'm planning on it next time I make these. Oh my - those look so good, and so simple. Now all I have to do is scale down the recipe so I don't eat the entire pan! Megan, I'm pretty sure the recipe can be cut in half pretty easily, since there's no baking required! yummm. I need to make these! Wow, those are very convenient when it is too hot to run the oven. I might just have to make some this summer. Wow, these look great. Chocolate and peanut butter were just made for each other, don't you think? nothing like a good sweet treat that requires no baking. these look great. My wife made me these for Valentine's Day using this and they were edible, but your recipe calls for WAY too much sugar! She only used 14 oz instead of a pound because it's all we had and they were still almost unbearably sweet, with the sugar almost completely drowning out the peanut butter flavor. I looked at some other recipes around the internet and found that they use at most 2 cups or a half pound of powdered sugar, although the Toll House recipe uses only 1 cup powdered sugar to 1 cup peanut butter, which I suspect is a better ratio. Deckard, you're right, these are incredibly sweet. It's not a misprint, however, this is how they've always been made. 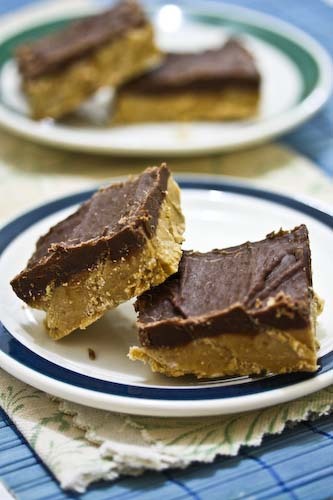 More like a peanut butter fudge than anything else, really. 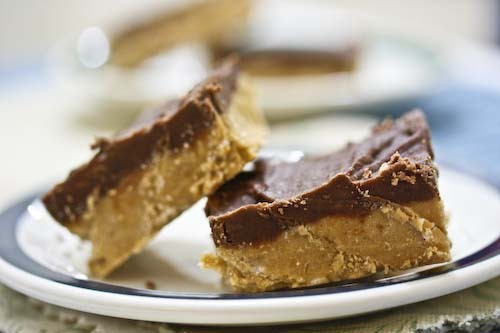 (For example, one peanut butter fudge recipe I've seen calls for 3 1/2 cups confectioner's sugar and 2 1/4 cups brown sugar per 3/4 cups peanut butter.) Needless to say, they're not meant to be finished off in one sitting, but savored like any good piece of too-sweet fudge (which they pretty much all are). I just finished whipping up a batch of these, and now I just have to wait for them to cool in the fridge. I can't wait! I did sneak a bit of the peanut butter mixture before putting it in the pan. It was good! One tip for those who like their peanut butter treats to have more of a Reese's peanut butter cup flavor -- add a tsp or 2 of salt. That can also help balance out the sweetness. I also decided to add crunched up rice crispies along with the graham crackers just for some added texture. Hopefully, they will still turn out well! Leiris, salt is a perfect idea. I'm going to update the post. Hope yours turned out well!